Johnson County Sheriff's Office, KS has launched a new government website focused on maintaining public safety through open communication. The website offers a clean design and efficient navigation, helping site visitors locate necessary information quickly. The website was created with the help of the experienced website development team at Vision Internet. Our new website is better equipped to serve the public. Information is organized, easy to update, and more readily available to our residents. 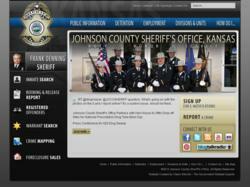 Johnson County Sheriff’s Office unveiled a new website today. Using the same URL – http://www.jocosheriff.org - the redesigned website is focused on keeping citizens better informed to maintain safety within the community. It had been 8 years since the last redesign of the Sheriff’s website and Vision Internet was the company selected to give it a much-needed makeover. The website’s new tailored look leaves no question as to where you’ve landed. The color schematic closely resembles the familiar uniforms worn by the deputies and the header proudly displays the Office’s logo badge. Interior pages follow suite, providing a clean and professional background for visitors to surf the site. Navigating to important information within the site is easier than ever. The dynamic homepage buttons link visitors directly to the sites most visited pages, including inmate, warrant, and registered offender searches as well as crime mapping and foreclosure sales. All other information can be easily found using a helpful network of dropdown menus, interior left-side navigation, and quick links found in the site’s header and footer. The new website was created with the government website developers of Vision Internet. The Vision Team best fulfilled the two major requirements of the Sheriff’s Office: to provide a robust government content management system – the Vision CMS™ that enables multiple non-technical staff to make site updates and to enable the Sheriff to host the site on the agency’s servers. According to local laws the agency was required to host its site in house. For further examples of public safety making the most of emerging technology, please visit the Odessa Police Department website and the Collier County Sheriff’s Office website. For more information about the Vision CMS™, please visit http://www.visioninternet.com/freedemo.